Beer stein (/ˈstaɪn/ US dict: stīn), or simply stein, is an English neologism for either traditional beer mugs made out of stoneware, or specifically ornamental beer mugs that are usually sold as souvenirs or collectibles. In German, the word stein means stone and is not used to refer to a beverage container. Such Steins may be made out of stoneware, pewter, porcelain, or even silver, wood or crystal glass; they may have open tops or hinged pewter lids with a thumb-lever. Steins usually come in sizes of a half litre or a full litre (or comparable historic sizes). Like decorative tankards, they are often decorated in a nostalgic manner, but with allusions to Germany or Bavaria. It is believed by some that the lid was implemented during the age of the Black Plague, to prevent diseased fleas from getting into the beer. 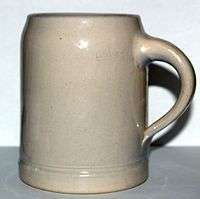 A typical half-litre German Humpen (beer mug). "Stein" is an abbreviation of German Steinzeug "stoneware", the common material for beer mugs before the introduction of glass. The word alone is not used within Germany, rather Krug or Steinkrug are used. The word "stein" could have also originated from the German word Steinzeugkrug, meaning stoneware jug or tankard. By common usage, stein refers to a beer container with a handle and hinged lid. Bierstein in German means "beerstone" – i.e., "beer scale" – a hard residue of calcium oxalate, protein, and sugar formed when a brewing vessel is used repeatedly without exacting cleaning. In the latter half of the 19th century, stein makers found different advantages within the different materials. The advantage in using stoneware to make steins was that molds could be used to mass-produce elaborately carved steins. In using glass, not only could one produce multiple glass mugs, but an artistic touch could add to the glass by including acid etchings, glass staining, or even multicolored overlays. Porcelain's advantage was that a stein fabricator could use molds to make "character steins", steins that had a particular shape modeled after an item or a person. Throughout the 1900s, collecting antique and replicated beer steins became very popular hobby not only among individual people, but in museums as well. Production of beer steins has become substantially large in America, but the largest producer of beer steins is Ceramarte of Brazil. 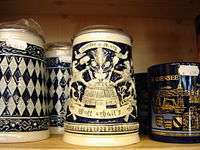 The most traditional area of beer stein production is the Kannenbäckerland in the Westerwald region in Germany. This unique German potters region has been creating beer steins for centuries and is famous among the collectors as the original German beer stein producer. On the 21st of September 2014, Oliver Strumpfel broke the record for most beer steins carried over 40 metres without spilling managing 25 steins. Beer steins were made primarily with pewter in many areas across Europe (primarily in England), but many steins were known to be made of glass, porcelain, and silver as well. Steins have also been known to have been made out of wood, earthenware, and crystal. Ordinary German beer mugs have been made out of glass for hygienic reasons since the introduction of glass mugs to the 1892 Oktoberfest. Modern beer mugs, except again decorative or luxury versions, do not have a lid. Beer mugs (0.5 and 1 litre) are typical for beer gardens and especially the Oktoberfest, where they are popular for their robustness. In other settings, 0.33 and 0.5 litre beer glasses are also popular. Attempts to replace beer mugs made from glass or earthenware by ones made from plastic (for security reasons) have been variously met with protests, even burnings of mugs and were never successful in the long or even medium term in Germany. The lids on beer mugs serve as a sanitary measure especially to keep insects out of the beer. They are usually made out of pewter, and are usually equipped with a lever that is in reach of the thumb, so that it is possible to grab the mug and open and close the lid with a single hand. These days beer mats are usually used to cover the glass or mug when required. An unusually large German beer stein with a 32-liter (8.45 U.S. gal) capacity that weighs 16 kilograms (35 lb) when empty. Seidel or Seidla (Franconia, ½ litre). The term Seide is also used by the Pennsylvania Dutch in the Pennsylvania Dutch Country. Considered collectible are traditional designs such as brewery emblems, Bavarian motifs such as Neuschwanstein or the Marienplatz Rathaus-Glockenspiel of Munich, and the colorful official annual Oktoberfest souvenir mug featuring the year's winning poster design. The use of beer mugs is uncommon in most parts of Northern and Central Germany, and in these regions considered a Bavarian specialty. Wikimedia Commons has media related to Beer steins. Beer stein made in Poland. 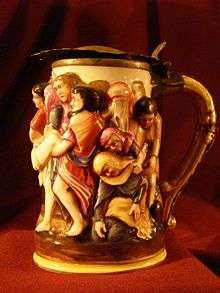 A late-19th-century German beer stein. Beer stein commemorating Milwaukee City Hall. 1 2 3 4 Kirsner, Gary. "A Brief History of Beer Steins". ↑ Glenday, Craig. Guinness World Records 2016. 87. ISBN 978-1-910561-01-0. 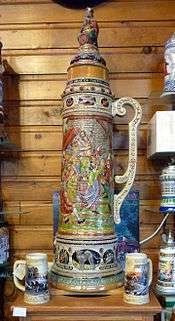 1 2 "German Beer Stein History". Stein Marks provides a database to determine the provenance of any stein.